"It is a pleasure to strongly recommend this book to all health service managers, professionals and students interested in the concepts of decision support systems and their application." - Duncan Boldy, Professor of Health Policy and Management, Curtin University of Technology, Western Austraila* What are decision support systems? 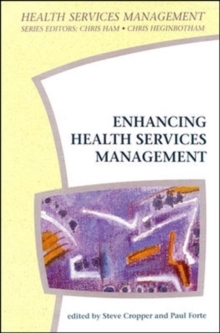 * How can they enhance decision making in health services management? * Where are there examples of decision support systems working in the field?This book has been written for practitioners and students of health services planning and management. It will also appeal to information specialists interested in developing means of supporting health service managers. It focuses on a critical area for management - enhancing the decision making process. Both the quality of decisions and the manner of decision making reflect the ability of managers to recognize and address the complexities of health services management tasks and to balance differing demands. These include pressures for efficiency in use of resources, calls for improved quality and effectiveness in meeting objectives, and a concern to increase openness and accountability. In fifteen chapters, this comprehensive volume introduces computer-based decision support systems - frameworks, methods and techniques - which provide help in defining problems, what information is needed and how it can be most usefully analysed to support decision making. Use of such systems can enhance decision making in the health service by promoting careful analysis, considered judgement and the ability to explain the basis on which decisions are made.